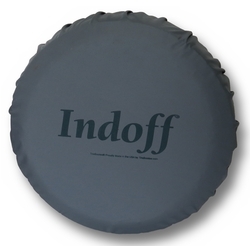 TireBooties® are furnished standard with the Indoff logo and Tirebooties.com as illustrated below. Custom imprints are available at an additional cost. When necessary we can supply TireBooties® with imprint on inside of the covers. This must be noted as all TireBooties® are made to order and generally non-returnable other than manufacturing defect. They may also be ordered with the TireBootie® logo upon request.